I always loved that song from Joni Michell until someone explained that she was referring to clowns and not clouds – as in “Send in the Clowns”. However the last lines of the song would be appropriate now with my malapropic interpretation. And where are the clouds? There ought to be clouds. –Joni Michell, “Send in the Clowns”, as interpreted by me. Today the metaphor of the Cloud as it applies to the internet has taken on a mythical aurora with anticipation nearly rivaling the other expected cloud event – “comes with clouds descending“. The shift could be as simple as converting computing into a utility all the way to the next epochal gestalt in the evolution of human kind (via the internet). My views tend somewhat beyond the IT dream of utility computing to the implications that this brings to our everyday lives. How we get from utility computing to where it impacts on us in the “real” world is the purpose of this post. Subsequent posts will deal with the details of how this transition might take place. The metaphor of the cloud is very old in technology years and is due to laziness and limited artistic skills of engineers. Instead of drawing out all the computers, switches, and lines between computers in a presentation, one would scribble some arcs that together appeared to be a cloud, much as one would add ditto marks for text leaving it to the audience typically other electrical engineers (the Double Es in tech parlance) to fill out the network diagrams in their heads. As networks became more complicated and the audiences more diverse, what was envisioned became, well, more cloudy. I would say nebulous. Eventually, the technical definition for cloud becomes: “I don’t care where it is at or the details of how I connect to it just as long I can locate it and use it.” This is an apt description of the internet or more appropriately – the World Wide Web – after universal resource identifiers (URI, of which URL is a specific kind) and hyper-text markup language (HTML, based upon hypertext which was a cool idea in the 80s that didn’t seem to be catching on) became bound to the internet through a standard port and protocol – HTTP. So the metaphor of the Web could be considered the first cloud (Cloud 1.0) with the internet world of FTP, Usenet, BBS, SMTP, TCP/UDP, and LAN / WAN, being the proverbial alphabet swamp out from which it crawled. Resources What can we put into the cloud? Computation How can we make the cloud do work? Information How do we find things in the cloud? Commerce How do we make money from the cloud? Network How do we organize and utilize wetware (humans) in extending the power of the cloud? Though this looks like a list of two oranges, two apples and a banana, they are essential co-equal areas of the Cloud. As consumers and users of the internet, we are well aware that we go to the internet to search (information), buy things (commerce) and connect with friends and family (network). In the latter case, our human urge to be social has extended beyond communicating to sharing, collaborating, creating and organizing at levels not entirely anticipated nor completely appreciated. In our darkest moments we can feel that we have been appended to the Web and at our most manic, that we are empowered by it. As users, we may not be as aware of what can be put into the Cloud (such as telecoms’ desire to meter access and charge fees like the old days, or Sen. Lieberman’s Internet Kill Switch) or the work performed by the Cloud (such as Google’s processing of all content on the web, or BitTorrent’s struggle with ISPs). After all the Cloud is supposed to hide all this technical stuff. None the less, much of the talk now a days concerning the Cloud is directed to cloud computing that involves breakthroughs in these two areas that can be expected to release yet another wave of change in the other three. So what can we expect to be the next wave of change propelled by cloud computing? To address this I will use another nebulous term often associated with the Cloud – Web 2.0. The purpose of this term is to represent progress (over Web 1.0) and the promise of further progress – Web 3.0. But these are more like best movie lists at the end of the year where each pundit brings out their view of what has been notable over the last year, or in this case, epoch. They are looks backward rather than outlines of forward-looking action. Some believe we have just arrived with Web 2.0 capturing the current mania around “social media”. Others have social media as a Web 3.0 product feature with promises of more. Still others believe that Web 3.0 will be sometime in the indefinite future, waiting in expectation for the coming of the Semantic Web. (And we thought the End-Of-Worlders have problems predicting the Second Coming.) In the end the differences are the features that each includes in their product road-map for the product that is the Web. As a YAP (Yet Another Pundit) here is my take on the features of the different versions and milestones marking the major transitions. To be fair the Web was never meant to become a phenom. It was initially conceived as a research tool that connected universities and international labs. This gave the Web its initial mythical aurora as a place where there may actually be useful information. In the end, it was just student’s homework or their complaints about homework. Scholars are not so keen on simply sharing the research with just anyone. But this illusion still prevails to this day. So Web 1.0 is the epoch of experimentation and discovery. from Mosaic (1993) – Dot Com Bust (2000). Resources Initially universities and research laboratories. Enterprises starting with a single server with a modem and building to racks of HTTP servers managed by corporate IT serving almost entirely HTML content. Information Surfing links of hyper text leading to aggregators compiling lists of recommended sites. Directories (Yahoo) and Search Engines (AltaVista) with limited computational resources to index the web. Commerce Market cap for internet companies not based upon revenue or profits but innovation and future shock euphoria. Network Email, messenger, and personal web sites with walled gardens such as AOL providing simplicity as well as proto-Facebook features to the technically timid public. Web 1.0 ends with the bust of the Dot Com Bubble in the late 90s. Like our mole-like ancestors at the end of the Cretaceous Period, some survived to become the new genre of the next epoch. Web 2.0 has some 2.x releases that reflect a changing landscape but are not sufficient to indicate epochal transition. These can be confused with Web 3.0. For example, social media has been defined by some as a component of Web 3.0 (here 2.2) or the transition from computers to mobile devices (here 2.3). Some lump Google and Yahoo into Web 1.0 (here 2.1) because they were not social but they addressed another area of the web, as do eBay and Amazon. I argue that, though there are several paradigm shifts, the full potential of Web 2.0 does not come to bear until the introduction of smart phones in the last 2 to 3 years. This broke down the walled gardens and allowed users to bring social media and search to the store and restaurant where conversations and decisions are made, establishing the platform for the next stage of evolution. The web becomes the glorified napkin or Marshall McLuhan in your pocket. The catch phrase for Web 2.0 is “convergence” where the Internet meets the Streets – Main, Madison, and Wall – and takes on the paper, film, and record moguls. It also propels the third wave of globalization from finance, manufacturing to out sourcing engineering and management. Talk about cannibalization! Resources Hosting platforms for e-commerce and publishing provided for free or affordable rates to allow anyone to start a web site and grow a business or following. Novel resources from web cams and satellites to milling machines and houses to entire power grids and factories. Net Neutrality and Federal tax moratorium allows the internet to grow unencumbered by taxes and metered access fees. Blackberry integrates business email and calendars into the Web. Smart Phones bring the full web onto the mobile device and break the Telecoms walled gardens. Computation Browser wars concluded allowing standardization of HTML with embedded plug-ins such as Flash. Google uses Map Reduce to process all the content on the web and enable search for the first time over the entire web. Service Oriented Architecture allows development of application program interfaces (APIs) that provide scalable access to computing resources for both clients and servers. Google dominates by applying algorithmic search to all content on the web. Wikipedia uses collaboration and informal groups to establish an encyclopedia on line, a paradigm process that will be repeated in news, publishing, and video production. Google makes maps a central component of information access allowing mash-ups of maps with almost any form of information that can be localized. Yahoo allows third parties to add plug-ins to their search platform allowing boutique search engines to scale to the entire web. Microsoft develops Bing that adds some semantics to the search engines to provide more relevant results. Wolfram introduces Alpha that supports natural language queries of any search that involves numbers or computations. Commerce Goto invents pay-per-click search monetizing text ads for publishers and advertisers. Yahoo works out how to monetize display marketing on line and bring back major advertisers online. Sorbanes-Oxley Act of 2002 allows the web to become a trusted sector of commerce. eBay and Amazon introduce commerce engines that generate revenue and establish integration of supply chain and shipping into the Web, another paradigm that is replicated throughout all economic sectors. Apple works out how to allow music to be monetized on-line with the iTunes Store which is eventually extended to videos. Web Analytics and Marketing Channels combined to provide performance based marketing and direct link between online and offline enterprise performance objectives. Network Personal web sites becomes more platform supported resulting in blogs and groups forming the blogosphere. Sharing becomes a key element starting with music (Napster); then photos (Flickr), bookmarks (Delicious) and later self-produced videos (YouTube). Micro-blogging (Twitter and Tumblr) and integration of messaging into cell phones extend the social urge to share initially among friends and eventually among everyone. With Web 3.0 we are at a tipping point. The title could be “Empire Strikes Back” as conventional media and telecoms attempt to wrestle back power and control with the abrogation of net neutrality. Logic and reason indicate these efforts will fail but then we do not live in an age of logic and reason. None the less, I will proceed with the confidence that in the end evolution trumps raw power plays. Parts of Web 3.0 are being put into place now starting with the apps hosted on smart phones and tablets that can access the services of the web and recent breakthroughs in cloud computing. Resources Devices connecting with the web are more mobile and more capable allowing access where customers are making decisions. Hosting platforms are consistently more reliable and scalable allowing resources to be managed by third parties more easily and brought in and out of commercial web sites. Computation HTML 5.0 allows web applications to be brought to the client and services distributed throughout the web independent of client platforms. Map Reduce and Massive Distributed Processing web architectures are more available allowing for more innovation to be introduced at small initial scale and much reduced start-up cost. Information Search moves from keywords to ontologies allowing natural language access to more relevant information. Commerce Instead of providing monolithic services and products that meet every need such as Microsoft Office or Abode Creative Suite, businesses can focus more on their core competencies and technology innovation, allowing the network to mashup their services into complete custom applications for businesses and consumers. Simplified work flows and informal job differentiation replaces big companies relying on complicated work flows and formal differentiation of roles. More economic platforms such as iTunes and App Store simplify the marketing and distribution of services including manufacturing. Network The catch phrase for network is mash-ups – with Google leading the way with Google Wave that combines email, messaging, conferences, documents, and groups into one collaborative environment as well as provide another platform for developers to provide their niche services. The catch phrase for sharing will be collaboration moving from forming networks to enabling networks (social (Whrrl) and business (SalesForce)) to create and produce outside of corporate environments. To many the primary prerequisite to Web 3.0 is the Semantic Web where matches between queries and content are via semantic intent rather than the popularity of content. As one hones their query, the number of results is reduced rather than expanded and captures the latest relevant content rather than the one with the most references, which is typically out of date, out of fashion, and out of context. One can argue that such a transition from mire information to actual knowledge would be the salient feature of the next phase of evolution. On the other hand, the computational capabilities that will enable the development of the semantic web will also propel a distributed economic web that will have as large if not greater impact on our lives. In fact this economic engine is in full swing now causing the economic displacements across the full spectrum of jobs and locations as well as the current surge in iPhone / Android app development empowered by the Cloud by those displaced. Instead of small store fronts and garage start-ups, many of the apps involve only one developer but still provide new services in the Cloud – services hosted by cloud computing – without the concomitant IT, marketing and sales groups typically necessary in the initial phase of a start-up. This will be a pattern that will be amplified throughout the epoch. There are still some cloud illusions that have to be recalled. One is the image of geeks on their laptops in pajamas with a bowl of Cheerios competing with journalist not in pajamas with their legions of copy-editors, editors and fact-checkers. How do simplified work flows enabled by technology compete and overcome more complex organizations with highly differentiated roles that have developed and survived for decades if not centuries. It’s like protozoa taking down the Roman Empire. It can happen but are we doomed to returning to barbarism of looser standards of quality and deteriorating labor conditions? Is there something else going on here? Can the production values of Laughing Baby really compete with those of Avatar? Apparently the answer is yes!?! Can it be we really don’t know clouds at all? Before addressing these weighty questions there is yet another, the illusion is utility computing as something new. We have been here before. Consider the image of an IBM mainframe with terminals, individual accounts, and metered CPU and memory usage because the computer time is so much more valuable than human time, that we queued humans rather that computers. The assumption being that no one individual could fully utilize its awesome computing capacity, which I now carry around in my iPhone (the 2G not the new one). 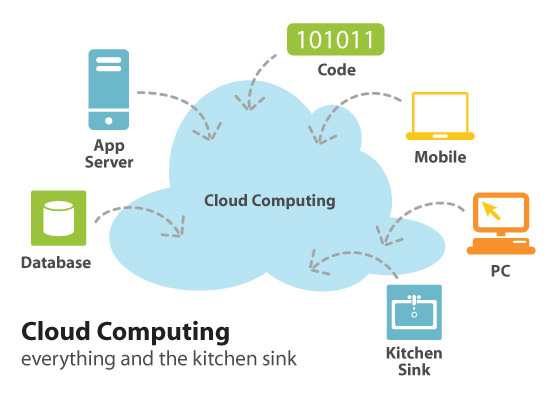 Actually this image called in this context will provide a interesting subtext to how cloud computing will evolve. May be there is something new! Since there is a propensity in computer science to give new names to old ideas, to penetrate this illusion of newness, we will need to look at the reasons that the new name has been coined. What technologically has changed that has given new life to an old idea? We will look at this plus the other side in my next post – Clouds of Hadoop. This entry was posted in Technology and tagged Cloud Computing, Joni Michell, Marshall McLuhan, Mashups, Media, Semantic Web, Social Media, Telecom, utility computing, Web 3.0, workflows. Bookmark the permalink.